This healthy meal can be made in a matter of minutes. It's perfect as a cold dish during the summer but can be enjoyed all year round. Cook the pasta as per the packet instructions or until al dente. Drain and rinse under cold running water. To poach the salmon, bring a small pot of salted water to the boil. Reduce the heat and add the salmon, then simmer for about 5 minutes, until the fish is cooked through. Gently rinse the fish under cold running water, then set aside to cool. Brush the ridges of a griddle pan with oil and set over a high heat. Brush the courgette strips with oil too, then add them to the hot pan a few at a time and cook each side for 1 to 2 minutes. Transfer to a large bowl and season in between batches. 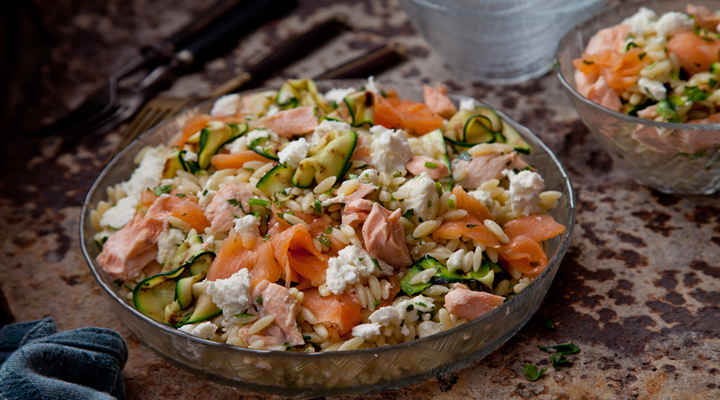 Add the pasta, feta cheese, herbs and lemon zest to the bowl, then drizzle with the lemon juice and dressing. Toss once or twice and check the seasoning. Flake in the poached salmon and add the smoked salmon too. Toss again until everything is evenly combined. Serve immediately. Tip: Build the dish by adding chopped olives or diced shallots for extra texture. Tip: Pan-frying the courgette ribbons in small batches will give them a crispier and greener feel.